Welsh bands aren’t typically at the top of the British music heap, but that’s not because the country hasn’t produced its fair share of amazing music. 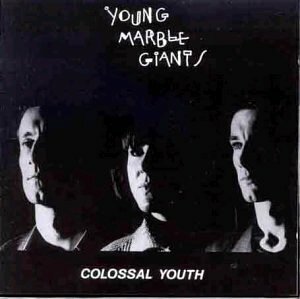 Young Marble Giants were one of the earliest truly post-punk bands to approach minimalism as a style. Their debut full length, 1980’s Colossal Youth, is a testimony to the ‘less is more’ philosophy of rock and roll. “Credit in the Straight World” takes advantage of not only the cool and detached vocals of singer Alison Statton, but also the chugging and chiming of sparse guitars and bass and a thin and metronomic drum machine. By the time the song finds its finish a mere two and a half minutes in, the band has done more than just create a moodscape that would make Spoon feel like it was playing far too many instruments, but has also perfectly evoked the black and white photographed faces of the album cover.